Could Future Smartphones Include Airbags Like Your Car? This is one of the most bizarre news stories coming out of the Android community this week. 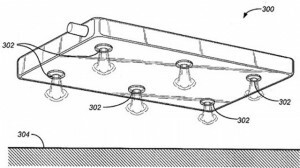 The Interesting Engineering page on Google+ posted a picture of a smartphone airbag concept. The idea is best described through the picture posted above. Basically, your Android smartphone (or iPhone, like the one in the picture) would be able to monitor sudden changes in trajectory or motion that would suggest the phone was being thrown or dropped onto the ground. 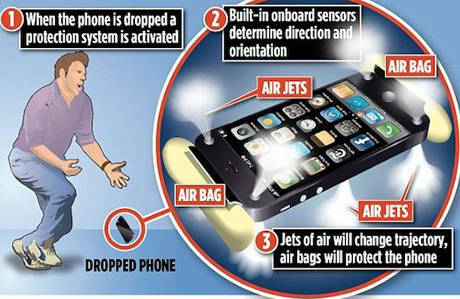 When the phone registered these sudden changes in motion, it would activate the airbags and then push air out of various jet holes to ensure the phone landed a certain way. Hmm. -If I’m running with my phone in my pocket, won’t that register as fast motion and could the airbags deploy awkwardly in my pocket? -If I gently toss my phone to my friend, would the airbags deploy in midair? -Could phones really continue getting thinner when they have airbag technology and small jets inside? -Isn’t this what cases are for? Will we see an Android with airbags? I’m not quite sure what that means, and who knows what a “previously successful Amazon Kindle Fire tablet” might be, but I’m going to go ahead and call Android airbags a fanciful notion that never hits the real world. It’s not even a good idea in concept.